While traveling I joined two support groups in California; Neutral Corner in San Diego, and Powder Puffs of California in Los Angeles (PPOC). These were instrumental in helping me to develop confidence and become part of a community of diverse, intelligent, and interesting friends. Upon returning to Florida, I founded two support groups - Gender Society of the Palm Beaches and Starburst, Clearwater FL. Both of which I believe still exist. At my insistence, these were open groups allowing all transgender individual to attend and fully participate. This was a time when support groups were important, providing a safe place to meet and discuss life’s issues. Remember, this was a time per-internet, and little or no information was available mainstream. Our discussion points ranged from accepting wig shops and makeup artist, to spouses who wanted additional information. It was during this time I appeared on a local Tampa Florida daytime talk show “Eye on Tampa Bay”. The host Kathy Fountain, somewhat of a local celebrity allowed me to pull together a panel from my support group and the Orlando group. The show was telecast live and presented before a studio audience. 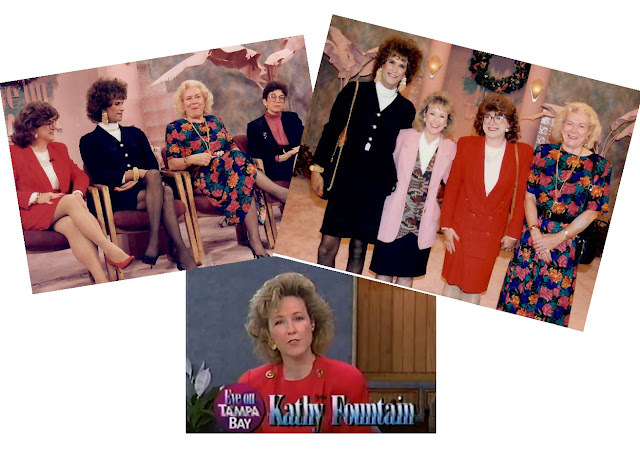 In the tried and proven talk show format, questions were asked by Kathy, questions were taken from the live audience and telephone call-in. It went very well. At the conclusion, I was allowed to promote the local support group and provide a post office box address for questions/comments. In a future post, I will print some of those. I had over a 100 letters of which 99% were supportive; some very touching. If by chance I am able to get an electronic copy of this show or a two night news piece on "The Cross Dresser Next Door" I will post them. This exposure helped do much to expand the Tampa support group and helped attendance at the Orlando support group as well. Orlando was within the Tampa television viewing coverage area.